Weighed down by domestic and global cues, markets were down on Tuesday, bringing curtains on the Hindu Samvat year 2071 on a weak note. Mumbai: Weighed down by domestic and global cues, markets were down on Tuesday, bringing curtains on the Hindu Samvat year 2071 on a weak note. The benchmark BSE Sensex shed over 378 points to close at a six-week low of 25,743.26 while NSE Nifty fell by 131.85 points to close at 7,783.35. Sustained foreign fund outflows, tepid second quarter corporate results and defeat of NDA alliance in Bihar elections seemed to have spoilsport in the markets. Also concerns over global economic growth in the wake of Chinese slowdown also left a negative sentiment. With markets ending in the negative zone on the last session of the Hindu Samvat year 2071, the Sensex dropped by 1,043.97 points or 3.89 per cent from the closing on Samvat 2070 (October 22, 2014). The NSE Nifty too registered a fall of 212.55 points or 2.65 per cent during the 12 months period. In a Samvat year, this is the third worst return given by Sensex in a decade. After falling 469.19 points in the previous four days, the 30-share blue-chip index continued its slide and slipped below the 26,000-level to touched day's low of 25,709.23. It finally settled 378.14 points or 1.45 per cent down at 25,743.26, its weakest closing since September 28. 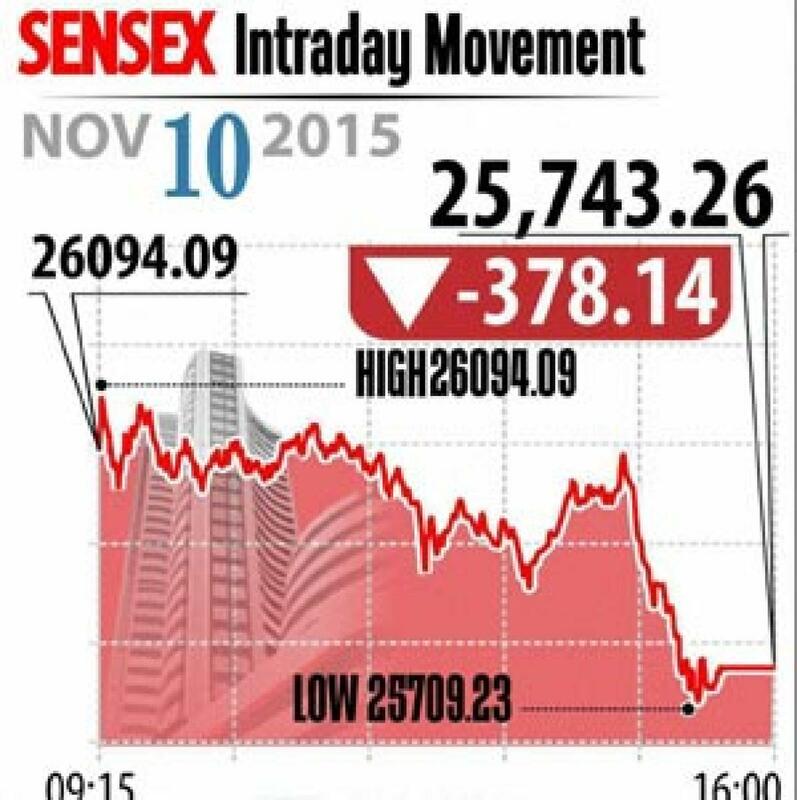 The NSE Nifty cracked below the 7,800-mark by falling 131.85 points or 1.67 per cent to close at 7,783.35. Out of the 30-share Sensex, 23 scrips ended lower. Major laggards were ONGC (4.90 per cent), Dr Reddy's (4.80 pc) and RIL (3.96 pc), among others. Bucking the trend, auto shares were in demand on strong performance during the ongoing festive season and robust sale numbers on Dhanteras on Monday. Prominent gainers were Maruti Suzuki, Hero MotoCorp, Bajaj Auto and M&M that gained in the range of 1.13-1.68 per cent. Sectorwise, BSE oil&gas index fell the most by falling 3.77 per cent, followed by metal 2.78 per cent, healthcare 2.53 per cent and realty 2.42 per cent. There will be a special muhurat trading session on both stock exchanges today evening between 5.45 pm and 6.45 pm on account of Diwali.